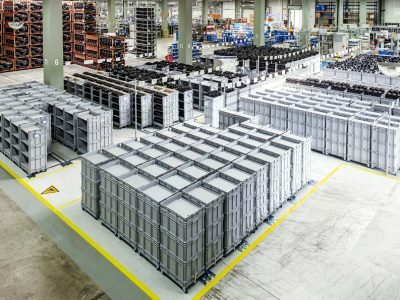 Mahle Behr, a supplier of car parts, uses 4.5 thousand WBR floor rollers in its branches. 1.5 thousand are used in the Thermal Management branch in the Bavarian town of Neustadt. On the one hand, the floor rollers serve as a means of transport, and on the other, they are used as mobile warehouses. They are part of the „Logistics 2020” project, aimed at transforming the entire plant, including its logistics base. in accordance with the principles of lean production. The company Mahle is present on all important global markets. It employs a total of about 75 thousand employees in 170 production plants. It is a partner in the automotive and motor sector – it specializes in motor systems, filtration, electricity/mechatronics and temperature control systems. The Bavarian factory of the company is located on 10,000 sq are meters production area and has 19 lines. Car air conditioning devices are produced for Audi, BMW, Land Rover, Porsche and Volvo cars. Lean Manufacturing is a management system that aims to reduce waste and eliminate unnecessary operations and procedures in the production process. 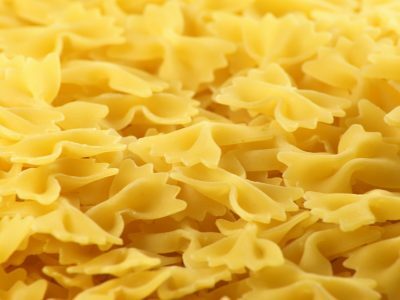 At the same time, it is to provide products and services of the highest possible quality, while maintaining relatively low production costs and eliminating the waste of raw materials. The project had to develop „FLOWline”, a new slim assembly concept and „flat storage”, which is to prepare a warehouse for the needs of lean logistics. The result is the creation of the so-called slim enterprise,” explains Hermann Horneber, logistics manager at Neustadt. The in-house optimization project „Logistics 2020” is based on four pillars: the concept of storage, container organization, transport concept and standardized work. Because the internal logistics in Mahle Behr are precisely matched to the requirements of production, the pace and cycles are set by the manufacturers of the automotive industry and their orders. The required components must be delivered exactly on time, in the required quantity and in the order required by the car manufacturers. Important tasks are carried out thanks to WBR floor rollers in this system. They were intended for completion in one sequence. The loading area is adapted to containers with dimensions compliant with euro standards. Stacking the containers in a stack saves space during storage. With an enormous number of parts and components, logistics is crucial. Wanzl is participating in the logistics process by supplying floor rollers. They are used in three shifts, practically all the time, as transporters for boxes, order pickers and as a mobile warehouse. The standard equipment of the floor rollers is quite similar. The support surface is made of mesh grate. It is also possible to coupling drawbar for coupling of multiple floor rollers. Up to six floor rollers can be connected to one another in a train. The chassis is also available without the coupling and drawbar. Rollers are also used for transport and picking but they also form a complete mobile warehouse on the load surface of a lorry. How does it work? Well, after receiving the delivery to Neustadt floor rollers with goods, i.e. loaded and stacked plastic boxes, are transferred to a mobile warehouse with a maximum stacking height of up to 1.6 m. The room can hold for up to 500 rollers. Downloading to the assembly lines takes place in accordance with the Pull principle (by controlling the process in accordance with the level of consumption, you can effectively produce what the particular customer ordered). The production uses floor rollers together with storage tractors (the so-called little train) in the number dependent on the order and the number of components to be assembled. At the same time, forklifts in Neustadt do not use forklifts. Floor rollers are ideally suited for future-oriented industrial logistics tasks. 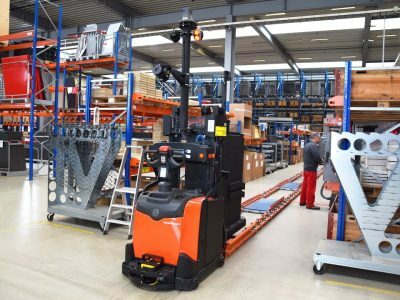 They provide support for automotive parts suppliers during value-added processes, ensuring a high level of standardization and shortest mileage times – assesses Wolfgang Kaup, Head of Logistics + Industry from Wanzl. Logistics 4.0 in practice. 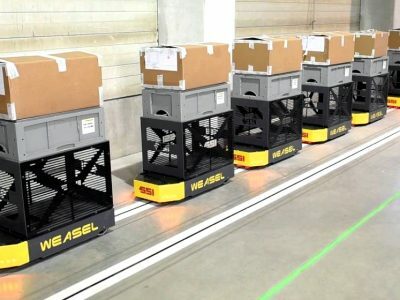 What are the advantages of Weasel transport system?